In a welcome development, Microsoft is joining the ranks of other companies such as Intuit and Insightly in asking their users what enhancements should be made to their products. 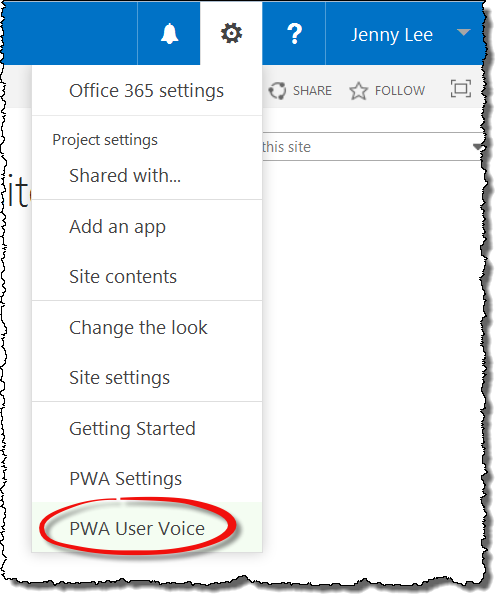 If you’re a Project Online user you’ll see a link to PWA Voice in the Settings menu of the software. Clicking on the link takes the user to Microsoft Project’s UserVoice Site for “all of your ideas and suggestions for Project Desktop, Project Server, and Project Online.” Users are given ten votes which can be applied to existing or newly entered ideas in chunks of 1, 2 or 3 votes. Many ideas have already been entered with the top idea, adding a custom field for selecting people in Project Online and Project Server, garnering 147 votes as of the time of this blog post. Hash tags and categories help organize the ideas and facilitate searching. Perhaps we’ll no longer need to make Microsoft Project enhancement requests via our Letters to Santa! 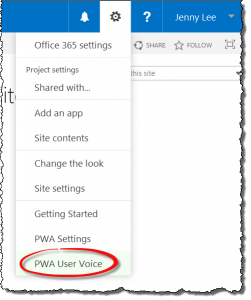 A link to the UserVoice site is now available in the Project Online Settings menu.